...Perpetual motion is the voice of general mankind; therefore it is no surprise that people from all the walks of life have given their thought to obtain perpetual motion. Einstein, whose relativity theory exposed limitations of Newtonian mechanics, once spoke of the laws of thermodynamics as the only scientific principles he had real confidence would remain unaltered as science continued to progress. [i] What are the implications of the first two of these laws for the study of origins? Ramananda sometimes expresses extreme resentment over the law of conservation of energy which has its root in Aristotelian materialism. Deva Ramananda feels that this 'impoverished and empty' principle fails to account for 'the wonder and mystery of universe, it fails to appreciate human self with its spiritual values, with its creativity, and with its uniqueness for each of us.' He criticizes this principle for allowing no real scope for creation. ...Of all the laws of science that have been invented, there is none more derogatory to the Almighty, more unedifying to man, more repugnant to reason, and more contradictory in itself, than this putative law called law of conservation of energy. Too absurd for belief, too impossible to convince, and too inconsistent for practice, it renders the heart languorous, or produces only anti perpetual motionists, atheists and fanatics. The law of conservation of energy and perpetual motion, as they stand in science in flagrant contradiction are like dark and light; fear and hope. Remember our Lord Jesus Christ said: we are the light of the world, and we should let our light so shine before men, that they may see our good works, and glorify our Father which is in heaven. Physics which rejects perpetual motion is the study of nothing; it is founded on nothing; it rests on no principles; it proceeds by no authorities; it has no data; it can demonstrate nothing; and it admits of no conclusion. Energy cannot be studied as a science, without perpetual motion, true principles which science discards without much thought and upon which it is founded; and as this is a absurd situation, physics is therefore the study of nothing. [i] Wysong, R.L., The Creation-Evolution Controversy (East Lansing, MI: Inquiry Press, 1976). All history writers on the law of conservation of energy have intentionally avoided even the mention of genuine perpetual motionist like Edward Somerset and Orffyreus, their masterly invention of perpetual motion. It is impossible to deny the merits of their works but knowing physicist’s utter inability to cope with truth of perpetual motion, they have wisely passed them by in silence. Helmholtz, it is true, in his “On the Correlation and Conservation of Forces”, has mentioned automata and their inventors, but with what care he evades mentioning even the names of distinguished perpetual motion inventors! He even forgot to mention Orffyreus, his own country fellowman. He passes over the work with a haste and sophistry that indicates how fully conscious he was of his own weakness and the strength of the opposite idea of perpetual motion. Perpetual motion yield simple, rational, and for the most part easily verifiable explanations on the fundamental nature of energy. To expose superstition, the ignorance and credulity on which law of conservation thrives, and to ameliorate the condition of the human race by providing free energy from the perpetual motion, is the ardent desire of a perpetual motionist who has a philanthropic mind. A perpetual motionist is prone to accuse pure physicist as being impractical, a dreamer who spins intricate patterns out of the web of his imagination, who builds theories that have little in common with the practical affairs of life. Undoubtedly, they have inherited this tradition from Greek philosophers who hated manual labour. In fact whole Greek philosophy is forerunner of science and it has contaminated to a great extent certain fundamental concepts, laws and theories of science. Law of conservation stands supreme among them. Of what utility these so called laws have if they fail to conform to truth? Why are they spoiling minds of younger generation? In fact, students need to be compensated for the mental exertion in learning these putative laws and for the loss of their zeal to invent perpetual motion machine in the same manner Euclid decided to give a coin to the slaves who would learn his theory. The story is told of Euclid that a youth who had come to him for instruction, after having learned the first proposition, asked: "But what am I to get out of this?" and Euclid for reply commanded a slave to give him a coin, since he needs must have a gain for all that he learned. This volume deals with the history of development of law of conservation of energy and its criticism in light of perpetual motion machine. The critical analysis presented on the law of conservation of energy is based on extensive evidence and experiments with perpetual motion. The book provides a good insight to researchers, planners and students of perpetual motion. I have adopted the historical method, and have attempted to trace origin and the development of law of conservation of energy from the speculations of the early Greek philosophers to the development of mechanics, electromagnetism and thermodynamics largely in 17th and 18th century in Europe. Later, quantum mechanics, relativity and other cosmological theories have been discussed in light of law of conservation of energy and perpetual motion. I believe that this method of treatment follows a natural order, and is important not only as possessing an educational value but also as corresponding to the logical development of the idea and principles involved. 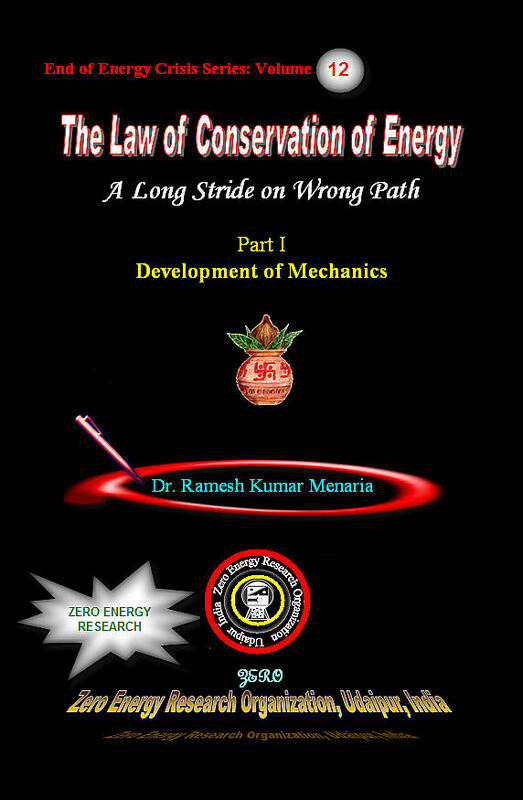 I have avoided going after mathematical details in making of law of conservation of energy. This book presents you history of perpetual motion and law of conservation of energy and critically examines the work of a generation of the scientist who has done harm to perpetual motion. Perpetual motion renders entire development of mechanics into comics. How Did Man Come To Develop Concept Of Soul That Survives Even After Death? Corollary I., Corollary Ii., Corollary Iii., Corollary Iv., Corollary V, Corollary Vi.